Livvie Owen Lived Here by Sarah Dooley. (Grades 6-9.) Feiwel & Friends, August 2010. 240 pages. Reviewed from ARC provided by publisher. All Livvie wants is to go back to when things were good. Back when the whistle blew on the paper mill every day at 6 o'clock and they lived in the warm, yellow house and Orange Cat was still alive. But the paper mill's closed and if she can't keep her outbursts under control, her family's going to be evicted again. It's not easy for anyone to deal with change and for Livvie it's a particular struggle because she has autism. But Livvie can't go back, so she's going to have to find a way to move forward. Ms. Dooley puts the reader right into Livvie's thoughts, which is definitely an interesting experience since Livvie sees the world a little differently than your typical narrator. Her heart is definitely in the right place - all she wants is for her family to be happy - but she's still working on controlling the pressure that builds up inside her and things often don't turn out the way she hopes. We're seeing more and more books with autistic narrators on the YA shelves, but one thing that makes Livvie stand out is the fact that her family is blue collar. There was a conversation amongst the KidLitosphere folks about class in YA/children's lit awhile ago, so I'm always on the look out for books that feature protagonists that aren't upper-middle-class. The Owens have rented various apartments over the years, often evicted because of Livvie's tantrums and behavior, no matter how hard Livvie tried to keep her cool. Moving around to different apartments, parents that are unemployed or underemployed - these are problems that all kids today (with or without autism) have to deal with. It's really nice to see that reflected in this book. This is a thoughtful story with a lot of heart and Livvie will stick with readers for a long time. I'd try this one on kids who enjoyed The Great Gilly Hopkins by Katherine Paterson or Also Known as Harper by Ann Haywood Leal for books about kids in lower socioeconomic environments. I'd also try it on kids who enjoy stories about kids with autism spectrum disorders a la Mockingbird by Kathryn Erskine. Check out this post that author Sarah Dooley made on the MacKids blog. Doing NaNoWriMo with her class of high schoolers with special needs inspired her to write this story! 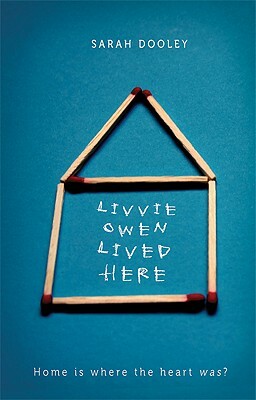 Livvie Owen Lived Here is on shelves now!